I did not grow up in Indiana, but one of the things I love about living here is finding the unexpected. Never was that truer, for this Rocky Mountain native and former ski bum, than when I learned of Paoli Peaks and Perfect North Slopes. Yes, Indiana—the state presumably flat—has two of the Midwest’s best ski resorts right under our nose. Scientists say the hills of Southern Indiana were formed thousands of years ago when glaciers pushed down from the Great Lakes, flattening northern and central Indiana, creating hilly terrain in the Ohio River Valley. And with it, perfect slopes for skiing. Paoli Peaks was first to emerge. Inspired by the tough winters of the late 1970s, Paoli physician, Dr. Richard Graber, thought a ski area was needed. Along with other professionals, he launched an investment option to finance building one. Shares were offered to anyone willing to buy. With roughly 300-400 original stockholders, land was purchased from several farmers in the hills between Paoli and French Lick. Included in it was 60 acres leased from Charles Marvin Weeks, who raised hogs, where the lodge sits today. Swiss-born Felix and Margrit Kagi were hired to manage the resort and build the actual slopes and lifts. When opening day arrived, there were three trails, a quad chairlift, rope tow and 500 pairs of skis to rent. That first season, in 1978-79, no one predicted it would take off as it did. Rental skis sold out with lines forming to rent equipment as fast as it was returned. On the heels of Paoli Peaks record-breaking opening, just east of there, on the Ohio state line near Lawrenceburg, a similar story was unfolding. Clyde and Ella Mae Perfect had moved their family of five children from Ohio, to a farm nestled in the wooded hills outside Lawrenceburg, in 1966. Clyde was a brick contractor and part-time farmer. Little did they know their lives were about to change forever. Kelly Green grew up in Lawrenceburg and in 1979 was a student at Indiana State University, majoring in recreation, when he approached the Perfects with an idea. He had completed a college project citing their farm as the ideal spot for a ski resort. His findings were based on the farm’s location, with its north-facing slope, and proximity to a heavily populated area—Cincinnati. After giving it some thought, the Perfects agreed. And the winter of 1980-81, Perfect North Slopes saw its first ski season. 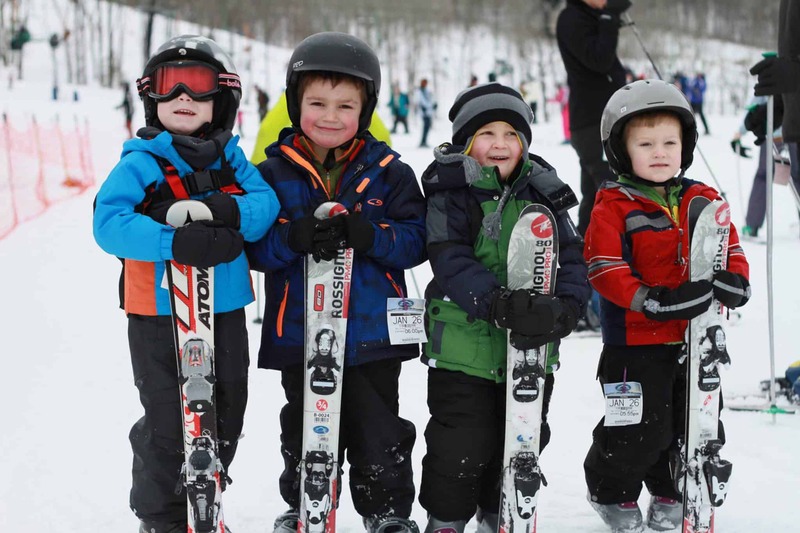 Forty years later, Paoli Peaks and Perfect North Slopes are going strong, each taking pride in providing family-friendly winter recreation. Both feature the latest in snow-making equipment and offer late-night, lighted skiing for die-hard fans. Their clientele span from Northern Indiana as far south as Alabama and Georgia, who see the Indiana slopes as an affordable alternative, closer than those in Colorado. Proof that each resorts’ humble beginnings and risk-taking paid off. Perfect North Slopes has remained a family business, with eight members of the extended Perfect family on staff. Chip Perfect leads the team as General Manager. With 22 ski trails, from beginner to advanced, five chairlifts, six Magic Carpet conveyor lifts, two rope tows, two terrain parks and 23 tubing lanes, Kelly Green’s prediction has indeed been successful. rope tow. Tubing fans have a hill with up to 14 lanes and a Magic Carpet conveyor lift. General Manager, Rick McMullen, a 10-year veteran with Peak Resorts, recently moved to Indiana. With a new park logo and website that he calls, “more user-friendly and visually appealing,” McMullen is excited to lead the resort into their 39th season. “Paoli Peaks is great family fun and fits all levels and abilities—with 25% of our trails for beginners, 55% intermediate and 20% advanced, along with two terrain parks, there’s something for everyone,” he says.